St Patrick’s Day is a bad night to try and find a quiet coffee in Brisbane’s CBD, even if it is to say farewell to a friend over coffee. Fortunately Cafe Mondial on Albert Street, which is a locally owned coffee shop, looked free from green hats. We were directed to a table by one of the staff, and ordered a pair of long blacks, one with milk on the side, and some wedges. My friend is from Finland, and as it turns out, adding cold milk over black coffee is pretty common in Europe. A number of other people I know have also seen the same in Germany and other northern countries. As both coffees came with a small jug of milk, I decided to use mine. 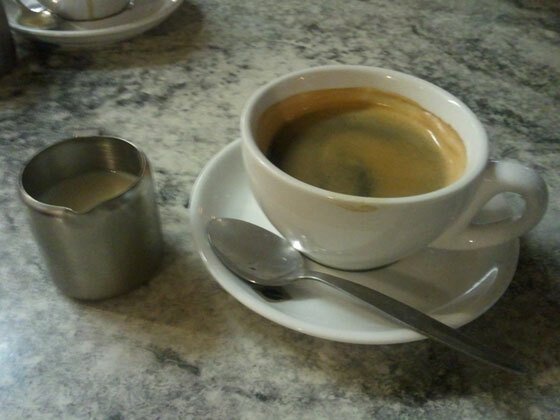 A long black with milk added is different to a flat white: the milk is cold and added over coffee with water. As most cafes in Australia tend to serve black coffee very hot, it was still warm after the cold milk was added. The coffee does not change that much, and seems more like a compromise between a long black or americano and a flat white. The milk takes the edge off any bitterness in the coffee and would be better suited to beans with a naturally harsher flavour. Cafe Mondial’s coffee is still as good as it was when I used to eat there while at university. Their menu does not seem to have changed much from what I remember either, aside from the prices, which are higher, and for some items, a bit over average. For me Wednesday is the worst day for buying coffee on the way to work. It is the day I usually run out of change entirely, or struggle to find enough small change for a takeaway coffee. This is why Epresso sounds like such an awesome idea. Epresso is a service where the users set up a prepaid account, and top it up online, which lets them order coffee online, from either a computer or smartphone. With this service, the customers pay for coffee without cash, and without slowing down service at the cafe. By ordering before they arrive, their coffee will already be waiting once they get to the cafe. The business won’t miss sales because the customer has no cash. The idea is very simple, and solves a small, but persistent and annoying problem, and that is why I can easily see myself using this, given half a chance. One Saturday morning, I stopped off in Stafford on the way to the city. I had been told that there is a cafe just off Webster Road, next to an Ultra Tune, that’s well worth checking out. In a few ways Elixir is a bit like the Merlo store on James Street. It also stocks a lot of coffee makng paraphernalia, including percolator seals, espresso machines, filters, etc. They also sell their own coffee beans. Arriving at Elixir Coffee, I ran into David, someone I know through Twitter. Once I ordered my long black, David told me a little more about the place. It turned out that he knew the owners. Elixir Coffee does not look much like a cafe, and it wasn’t one at first. David told me that Elixir Coffee began life as a small coffee roaster. The owners had always been involved in cafes, starting with the one their parents ran, and so it seems natural that they would have a real enthusiam for coffee, which shows in their product. They offer a range of different blends, and at least one single origin on offer at any given time. 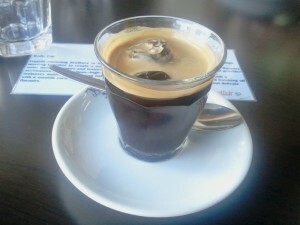 The coffee is the focus, with only a small but varied food menu. And every coffee is served with tasting notes on a small, laminated card. David suggested that I let the staff choose what I was going to have next. That is how I ended up with a ‘con hielo’ as my second coffee. The crema was impressive, and it was great to try something I hadn’t even heard of before and probably wouldn’t have selected for myself. 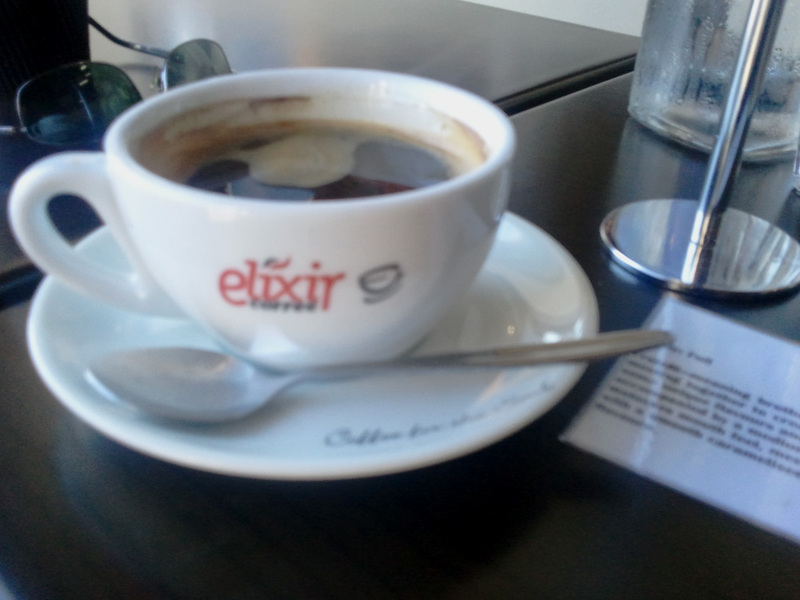 Elixir Coffee is worth visiting, assuming you love coffee. If you don’t, that’s your problem.